Lexington School faculty describe the significance of learning and growing alongside their students. 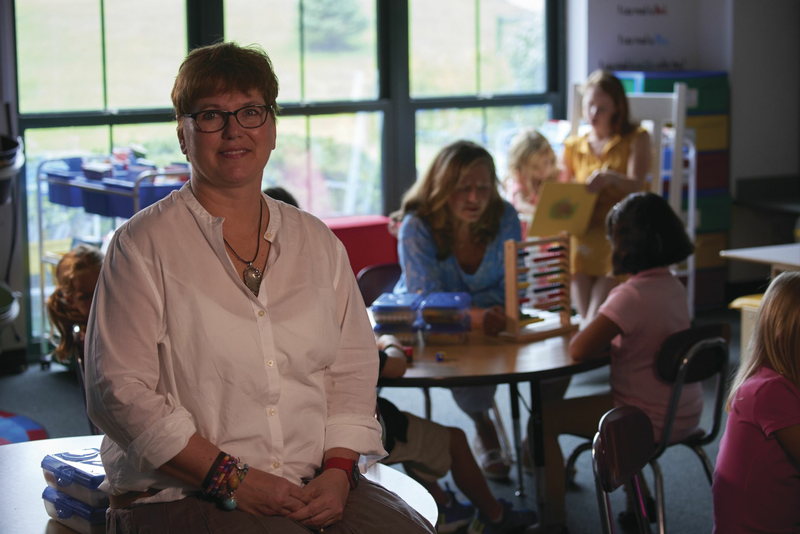 Laurie Nawor is part of a greater team of teachers who work day to reach each individual child. Andrew Schwartz '00, Math teacher, collaborates with colleagues on a mission skills moment. Continued training makes every interaction a valuable one. Sherry Cline works one on one in PK. "Gross Motor Gym Builds Stronger P.E. Program (and Kids)"
It’s the first day of school. Kids bounce into the classrooms, fresh from summer rest, happy to see their friends. The room is perfect. Cubbies are labeled, color-coded school supplies neatly stacked on desks; everything is in place for teaching and learning. So THIS is why the teachers come back so early? Not exactly. The days just before school starts are professional development days all over the country, days when teachers come together in meetings, share what they’ve learned from summer experiences, conferences, readings they’ve done. The days before the first day should operate as think tank of pedagogy, where teaching topics range widely but minds and hearts are inspired in preparation for being the best teachers for that individual child who’ll bounce right in a couple of days later. Faculty professional development is a top priority at great schools. Think of it this way: most schools in America have a wide range of learners in their classrooms because most schools have a wide range of socio-economics, diversity, and abilities in the students they teach. Ultimately, the goal for all educators is to positively affect student learning, take each child as far as he/she can go. However, given the various challenges and uncertainties of each classroom, the ONE thing that schools can control is teacher readiness. It all starts with the teacher. A great school knows this which is why it commits time and resources to the continued development of its faculty.